Concerns regarding leadership capacity and development have been heightened recently by increasing globalization, business complexity, and the impending retirement of vast numbers of seasoned leaders. This leadership gap has led an increasing number of organizations to place renewed emphasis on the development and acquisition of emerging leaders ? particularly Generation X and Millennials ? who show promise as the leaders of tomorrow. 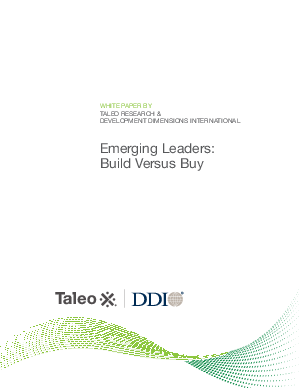 In an effort to define best practices in addressing these challenges, Taleo partnered with DDI to write a research paper outlining how to identify hire and develop emerging leaders-what to look for and how to use assessments and talent management technology, such as talent intelligence derived from robust and dynamic individual talent profiles, to achieve success. This paper highlights the practices and process required to develop leaders internally by building their capabilities, as well as the best practices required to acquire leadership talent from external hires by buying that capacity. This "build versus buy" question challenges organizations to think and act holistically across multiple talent management functions. It further requires that organizations develop deep insight into the talent they have and the talent they need, ideally through a single talent system of record for all employees.